What's the point in the Easter Egg? the meaning of the Easter Egg and its symbolism. One of the most common things you see at Easter time is the egg!! The Easter Egg has been a Christian symbol of rebirth and new life for thousands of years. Just as a baby chick breaks out of its shell and begins a new life, Jesus broke open the tomb as he began a new life for himself and gave hope to sinners that we too can now achieve the reward of new everlasting life in Heaven through Jesus!! This double sided project is simple and fun for younger children and any one who likes to color. 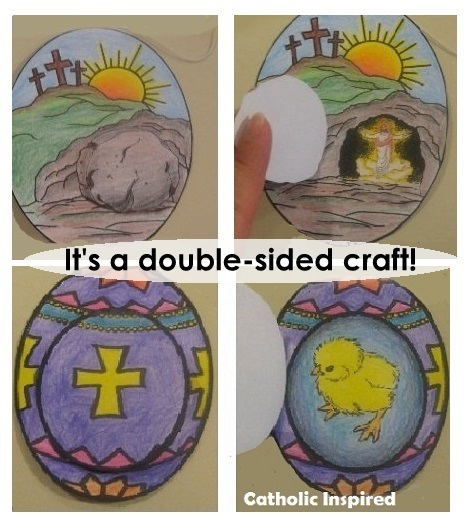 One side of this craft is an Easter Egg with a flap that revels a baby chick. The other side is a resurrection scene, which also has a flap that revels the resurrecting Jesus. It has a string attached to the top for hanging the egg craft so both sides can be seen. copy of the egg pages - free from our shop! 6 inch piece of string. Color the two eggs and the two flaps. Cut them out leaving the black outer line. Use a small piece of tape to attach the flap on one side so that it will open like a door. Be sure the flap covers the entire chick/tomb opening, but it should not stick out past the egg's edge. Tape the looped string to the back of one of the eggs, so the craft can be hung when completed. Cover the back of one egg with glue and stick the two eggs together, back to back. Use a black marker to color over the outer edges of the eggs were white is showing from the egg on the other side. This will make them look more seamless. Now hang up your lovely Easter Egg and have a Blessed Easter! Love it! My kids are excited to do the project.